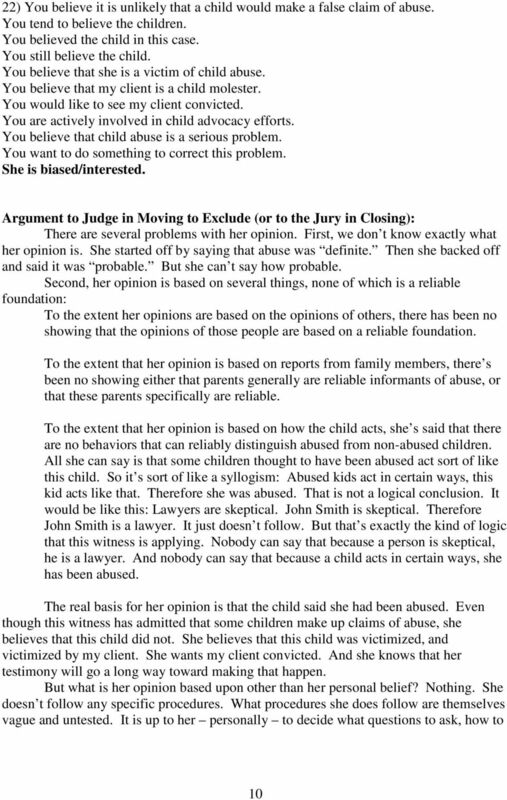 Download "CROSS EXAMINATION OF AN EXPERT WITNESS IN A CHILD SEXUAL ABUSE CASE. 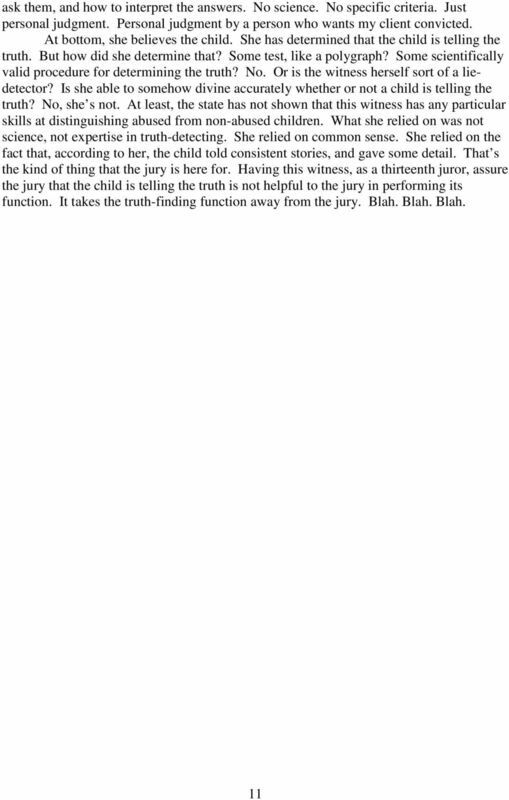 Mark Montgomery"
1 CROSS EXAMINATION OF AN EXPERT WITNESS IN A CHILD SEXUAL ABUSE CASE Mark Montgomery Post Office Box 161 Durham, NC (919) Opinion Testimony by a Pediatrician/Nurse/Counselor/Social Worker/Psychologist: Tiffany was evaluated for possible sexual abuse by a team, of which I am a member. 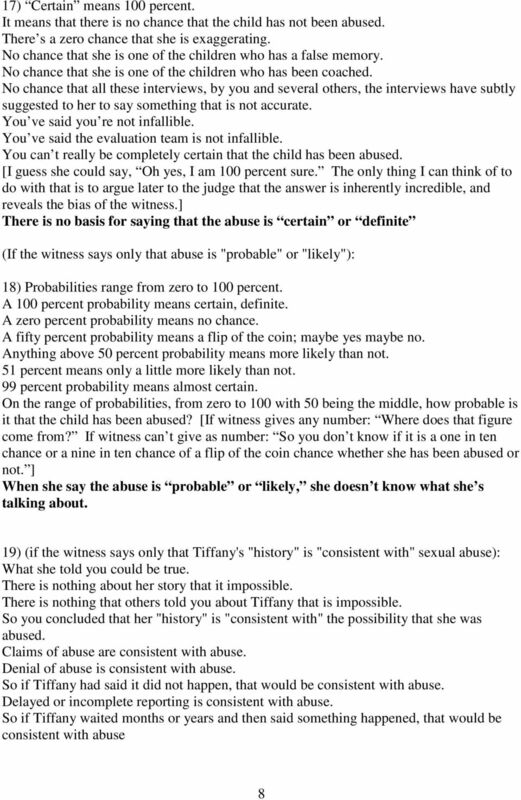 Based on the interviews conducted with child and family members, we concluded that Tiffany has been sexually abused [or that Tiffany's "history" is "consistent with" sexual abuse]. Cross-Examination: 1) You followed a protocol in this case. That protocol is made up of interviews, tests, etc. performed by a variety of people. 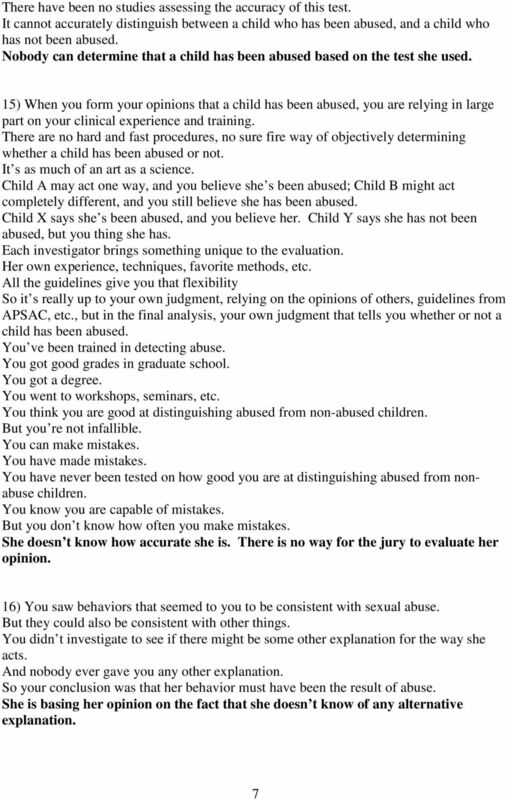 Based on the sum total of the tests and interviews, you and the others decided that the child had been abused. This protocol is loosely based upon the APSAC guidelines. 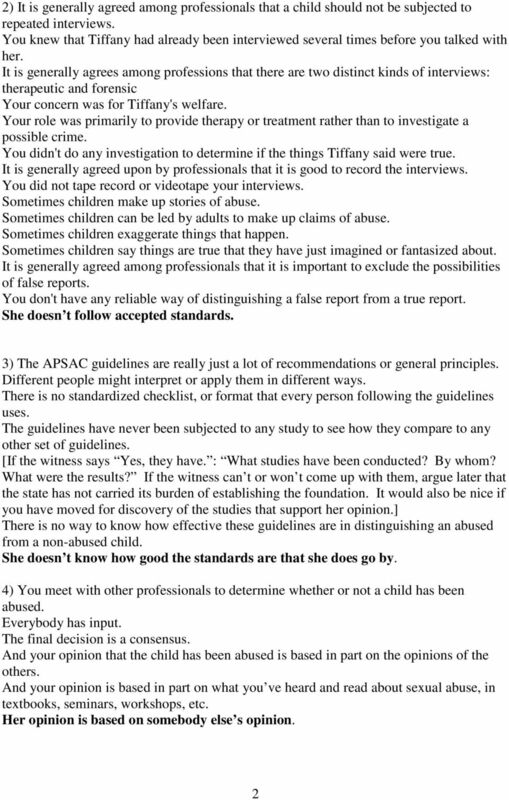 The APSAC guidelines are really just a lot of recommendations. Different people might interpret or apply them in different ways. There is no standardized checklist, or format that every person following the guidelines uses. The guidelines allow you to use your own judgment in a lot of ways. And you did that. And each case is different. 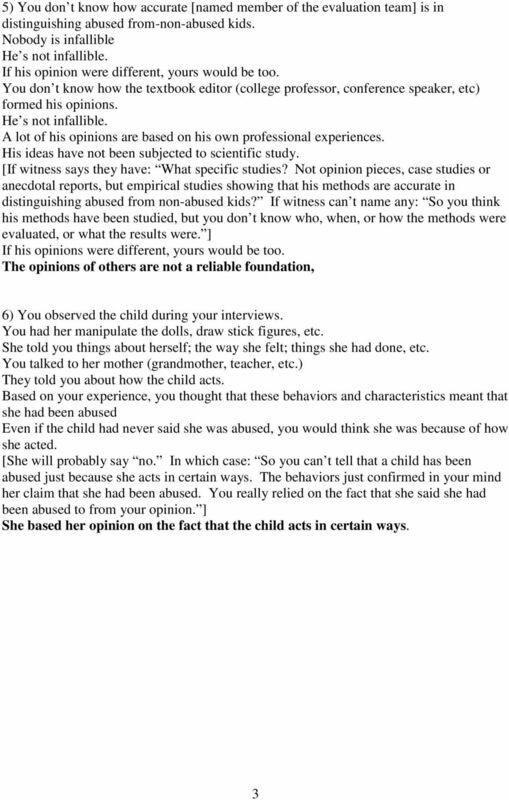 You might ask different questions to different children; give different tests, etc. You make up a new protocol to fit each new case, making whatever changes you feel are necessary. You use your personal judgment based on your experience. Different investigators might ask different questions. 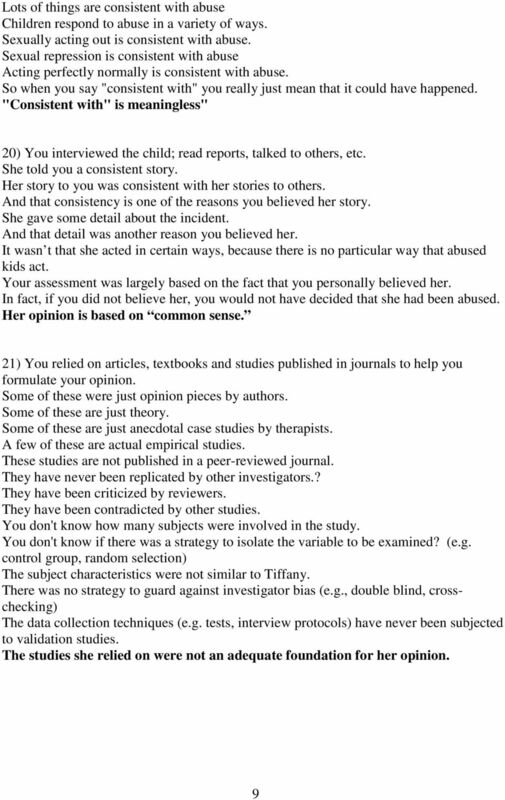 Different investigator might ask the same questions, get the same answers, but disagree about whether the child was abused or not. She doesn t have any standards. She relies on her own judgment. If You have Been Arrested Don t Do Anything Until You Read My Special Report! Professional Pathway. Forensic Psychology. Forensic Psychology. Forensic Psychologists. Forensic Psychology 7/17/2014. Thomas A. Powell, Ph.D.
What Lawyers Don t Tell You The Realities of Record Keeping Welcome to the Power of Attorney Podcast which is part of our Conversations that Matter Podcasts. My name is Mary Bart, Chair of Caregiving Matters. TRANSCRIPT An Interview with Jeanette C. Rudy. Video clip: I Collect Duck Stamps! EXPERT TESTIMONY IN CHILD SEXUAL ABUSE CASES Mark Montgomery PO Box 161 Durham, North Carolina 27702 (919) 680-6249 mark.montgomery@mindspring.com I. HEARSAY FROM THE COMPLAINANT UNDER THE "MEDICAL TREATMENT"
What can I expect facing criminal charges?